Thanks to advances in green odor management, virtually any organization can develop an effective and safe plan to fight the harshest of odors. To accomplish this, many of these forward-thinking organizations – from hotels, hospitals and sporting arenas to schools and universities – are now embracing the Fresh Wave IAQ M130 Vapor Phase Units, a “dry” dispersion system for the efficient and safe application of Fresh Wave IAQ Air & Surface odor eliminator. A solution that is safer than ozone machines, the M130 quickly eliminates a wide-range of odors, including smoke, soot, mildew, trauma scene, skunk, dead rodents, chemical, sewage, fuel oil, food, vomit, feces and urine. In other words, the M130 helps aid in rapid room recovery efforts, where foul odors are quickly eliminated – allowing any organization to get back to business as usual. To help educate both current and prospective M130 users, Fresh Wave IAQ has developed a series of comprehensive videos about the product. Below please find links to the videos. The first video highlights how the M130 offers a higher standard in odor elimination, and the second video is a comprehensive usage tutorial. Most major Las Vegas hotels and casinos have to deal with keeping every type of guest happy. Whether it’s a family on vacation, a bachelor party, or corporate conference goers, a wide-range of people stay, work and play at these Vegas resorts. This includes people who like to light up cigarettes – whether on the casino floor or in their guest rooms – which is an odor challenge for any facility. In addition, in the hospitality business where the ability to effectively clean hotel rooms is vital for revenue growth, many Las Vegas casinos are on the cutting-edge of safe and effective cleaning. This is especially true when it comes to odor management. In fact, Fresh Wave IAQ is seeing a trend happening where a number of resorts are now embracing next-generation odor management solutions that help support business growth while keeping every guest happy. One such solution is the Fresh Wave IAQ M130 Vapor Phase Units, a “dry” dispersion system for the efficient and safe application of Fresh Wave IAQ Air & Surface odor eliminator. It is becoming a popular solution for casinos and resorts in Las Vegas. Why? It’s easy, safe and effective. For example, one major Las Vegas casino simply rolls in the mobile M130 into the hotel rooms and allows the units to run for 45 minutes – rendering the rooms largely odor-free. Since the M130 uses an eco-friendly solution, it is safe for the housekeeping staff to work along side the unit while it is in use, saving valuable time. This casino also hosts an event for a major cigar magazine, which brings together a wide range of enthusiasts who openly enjoy smoking some of the world’s best cigars right in the facility. During last year’s event, the cleaning team placed two of the M130 Units right at the front desk – to help mitigate cigar odors that were making their way into the lobby and front-desk areas. “By doing this, we were able to completely rid these areas of cigar smoke, and we did not receive any complaints from the front desk employees and the non-smoking guests,” said the Executive Housekeeper of the casino and resort. 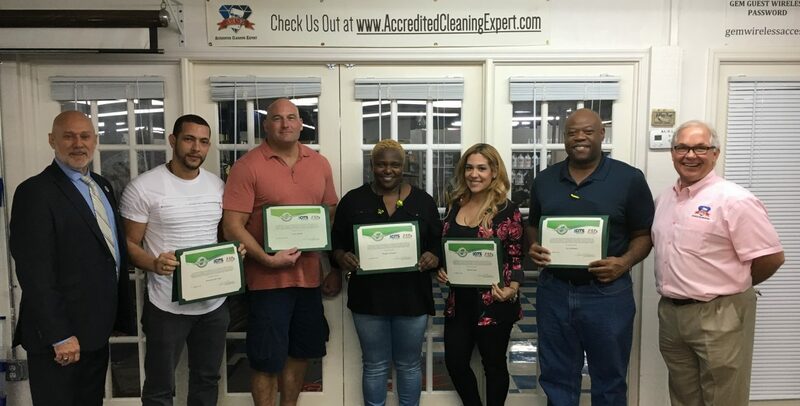 It is certainly an exciting time in Las Vegas when it comes to eco-friendly commercial cleaning. Safe and effective odor management is taking hold in the city and we look forward to showcasing more success stories. Be sure to check out our new video about how the M130 offers a higher standard in odor elimination below. Are you a cleaning executive at a major hotel casino and resort in need of safe and effective odor management solutions? Please contact Fresh Wave IAQ here. In addition, if you are a fan of the Fresh Wave IAQ M130 Vapor Phase Unit, we are excited to announce that the product is being considered for the 2015 ISSA Innovation Award. Please cast your vote for us here!